Whoever thinks that Word of God isn’t energizing has never attended the SCCS Grade 4 Bible Celebration! With 42 students and their families in attendance, it was truly spirit-filled. On this special day, the Grade 4 students spent time with Nancy Wood at the St. Charles Retreat Center. Ms. Wood is a trainer for Good Shepherd Catechesis and a popular retreat master for the Archdiocese of Winnipeg. Together with the Grade 4 classes, she explored the various books of the Bible, the calligraphy associated with original handwritten Bibles, and several poignant Bible verses. Each of the students was tasked with creating a beautifully scripted and colored rendition of his/her favorite Bible verse. By evening, the students were ready to share their excitement with their families. The service began with a procession, prayers, readings and songs. Fr. Peter Nemczek, Archdiocesan Vocations Director, shared his personal experiences with the Bible and blessed all of the Bibles. 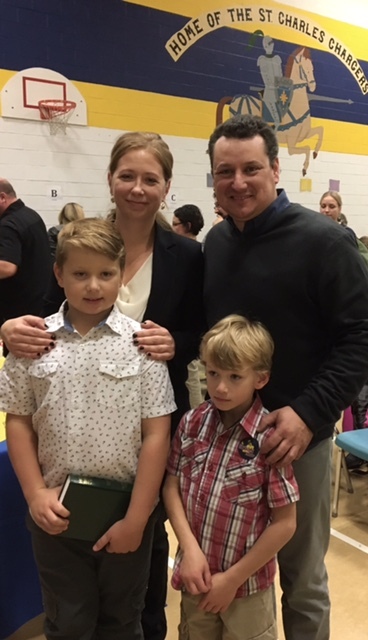 The highlight of the evening came when each family stepped forward to bless their grade 4 student and present him/her with a personal Bible. Tears of happiness were seen on more than one face as children beamed while parents shared their own faith experiences in a tangible and very real way. The evening ended with a reception hosted by the Grades 1-3 classes. In faith and in gratitude we belong to the SCCS community! This entry was tagged Bible Celebration. Bookmark the permalink.